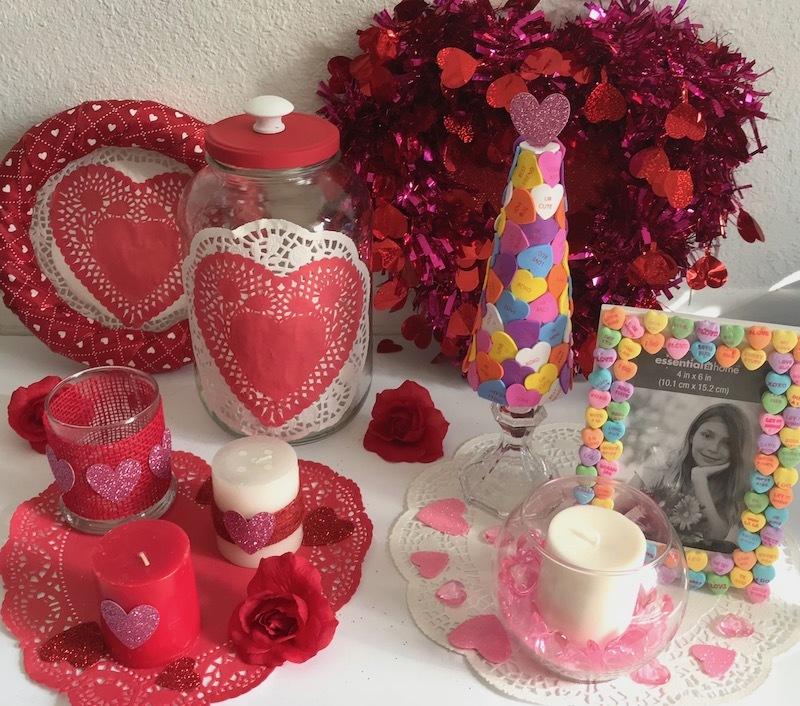 Spread the love with these cheap and easy valentines day decor ideas. Each of these projects can be made for around $5 each. They only require basic crafting supplies and take less than 15 minutes to make. 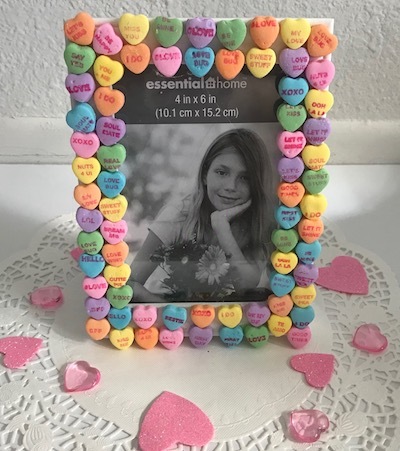 The majority of the materials needed for these projects can be found for $1 each or less at Dollar Tree or Walmart. 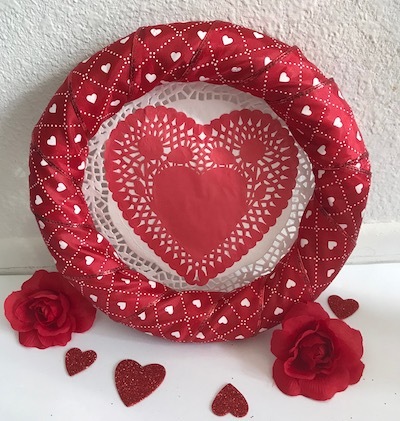 Using the foam brush, coat the back of the heart doily with Mod Podge and then flip it over and place it in the center of the round doily. 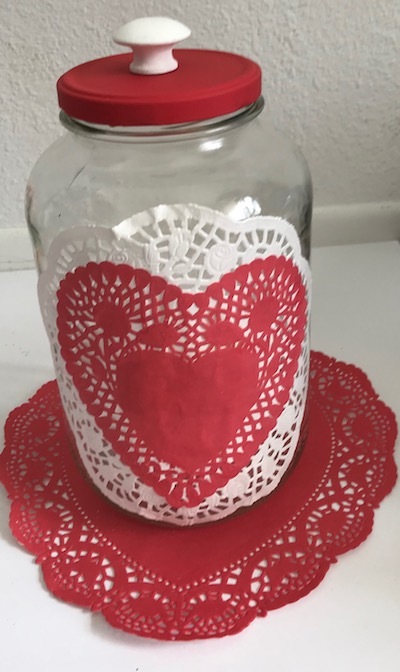 Wait until dry then coat the back of the round doily with Mod Podge and place in the center of the jar. While it’s drying, paint the jar lid red and the wood knob white. Using a glue gun, glue the knob to the center of the jar lid. Wrap the ribbon around the foam wreath and glue each end in place with a glue gun. coat the back of the heart doily with mod podge and put it in the center of a round doily. Using a hot glue gun, glue the edges of the round doily to the back of the ribbon wreath, facing forward. 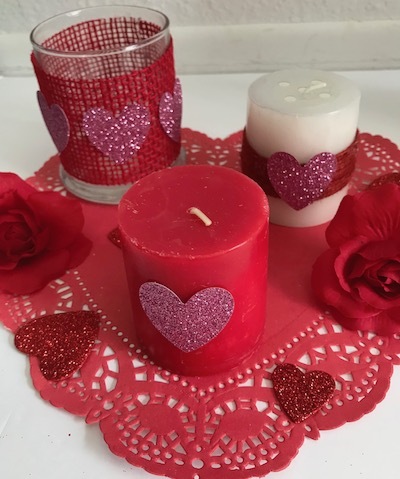 Red Candle: Put hot glue on the back of a glitter heart in the center of the red candle. 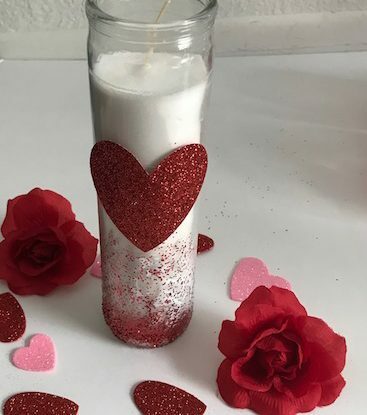 White Candle: Wrap red twine around the center of the white candle and glue into place using a glue gun and then put glue back of a glitter heart in the middle of the twine. Glass Candleholder: Wrap burlap ribbon around the candleholder. Cut off excess ribbon. Glue ribbon into place with a glue gun. 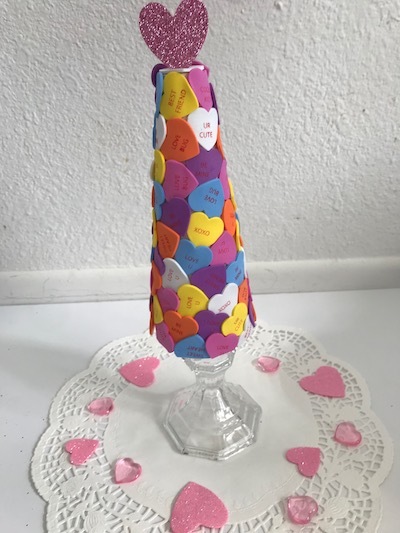 Put glue on the backs of the glitter hearts and place them in the middle of the ribbon. Wrap garlands around the wire heart wreath, securing it with pipe cleaners on each end of the garlands. Sprinkle glitter heavily on the bottom and then lightly toward the top to create a tapered effect. 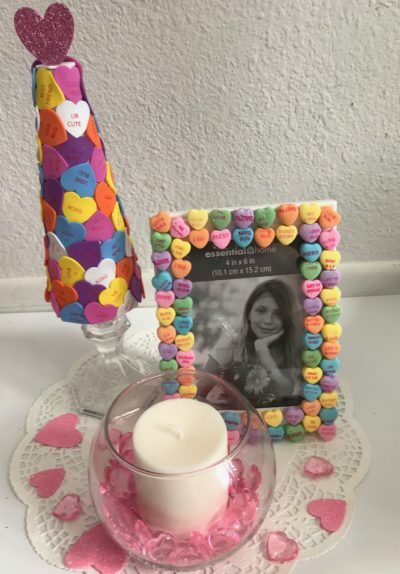 Make sure to lay down newspaper or a paper plate underneath the candle before you start glittering the candle so that it is easy to clean up. Using a glue gun, add glue to the back of the glitter heart and glue it to the center of the jar candle. Add the stickers to the foam cone, making sure to not leave any gaps. When you get to the bottom of the tree, you may have to cut the bottoms of the stickers to fit. Using sharp scissors or craft knife, cut a small slit in top of the tree. 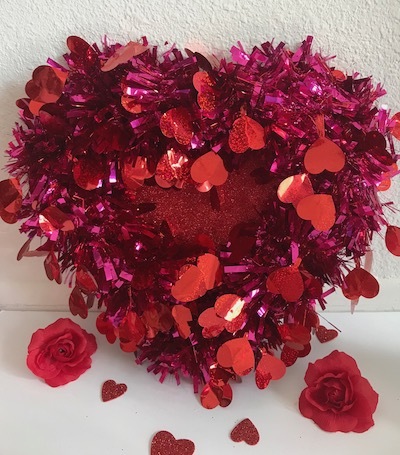 Fill with hot glue and put glitter heart into the slit. Let dry and then glue around the base of the taper candleholder and put the cone in the middle.